Here is a rare opportunity to live in a lovingly restored 18-foot wide townhouse with all the details of turn of the century. This three- story townhouse includes: pocket doors, a dressing room with original oak cabinetry, wainscoting, wood shutters, a hand carved staircase, five decorative fireplaces with original tiles and three skylights. This home has a gorgeous eat-in-kitchen overlooking the beautifully manicured garden and patio.This charming home has four floors with eight rooms which include four generous bedrooms, three renovated baths and jumbo washer/dryer. Great light is in abundance throughout this single-family house. You can look out your bay windows and enjoy the wide-open views of the park that surrounds the Morris-Jumel Mansion on this historic cobble stone street. The neighborhood that surrounds this townhouse is the heart of the Jumel Terrace Historic District that includes Sylvan Terrace and the brownstones of West 162 Street. 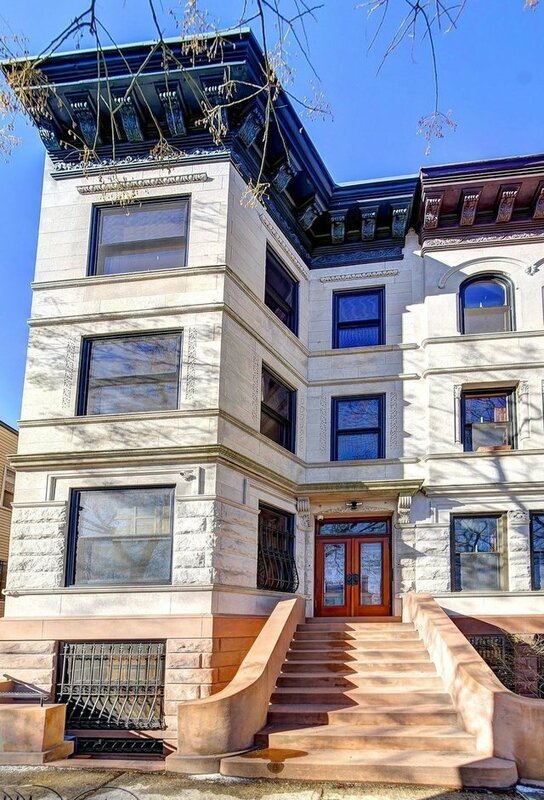 This Romanesque Revival style townhouse was designed by Henri Fouchaux for William Watkins in 1896 and is one of five landmark houses on Jumel Terrace.